​Nothing breaks my heart more than visiting a church who once had great momentum, impact and influence, and then when seeing its current attendance, health and condition having to ask, “What happened?” The picture above illustrates this. The parking lot of this once great church is cracked, unkept, has weeds growing in it, and is in desperate need of repair. Sadly, the same thing could be said for this church. The parking lot is merely a visible representation of the church’s current condition. Taking this recent picture broke my heart. On August 26, I will be celebrating my 15th anniversary serving churches with INJOY Stewardship Solutions. In short, I help pastors and church leaders with leadership development, readiness, generosity, need, timing and how to incorporate capital campaigns into their unique ministry plans. What is unique about my calling is I only work with growing churches. The most important lesson I have learned over these 15 years is growing churches are led by growing pastors and leaders. I have also noticed many differences between pastors whose lives and ministries have health over a long period of time and “shooting stars” whose ministries briefly skyrocket and then either the church or the pastor flames out. 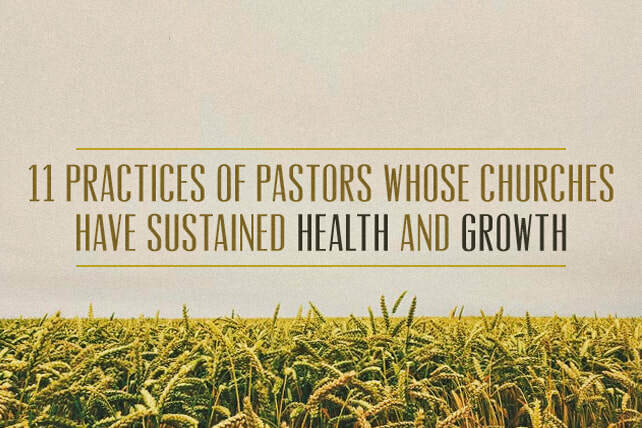 The following are 11 Practices of Pastors Whose Churches Have Sustained Health And Growth. You will notice each practice contains a “P.” Some of these will be unpopular but I have seen WAY TOO MANY pastors needlessly fail and I’m sick of it. I want you to be aware of what I am seeing. Pastors Whose Churches Have Sustained Health and Growth Have Proper Priorities – They place God first, Family second and the Church third. They refuse to sacrifice their family on the altar of increased church attendance. Pastors Whose Churches Have Sustained Health and Growth Are People of Prayer – They dedicate specified time each and every day to Bible study and listening to God. They have spiritual disciplines which result in calloused knees. And when they stand in the pulpit on Sunday, their congregations intuitively know they have spent time with God and have a word for their lives from Him. This leads to my next point. Pastors Whose Churches Have Sustained Health and Growth Are Preachers, Not Communicators – This will be controversial but true. I know many people mean nothing negative by this term, but communicators can tend to give a talk, often a TED Talk with a Bible verse. Preachers have a message from The Ancient of Days to give to a certain group of people at a certain point of time in human history for the issues affecting their lives. To have a lasting ministry be a preacher, not a communicator. Pastors Whose Churches Have Sustained Health and Growth Are Willing to Pivot – They are willing to change. You should never change your core values or commitment to biblical truth but always be willing to change the method of how you deliver ministry. Pastors Whose Churches Have Sustained Health and Growth Celebrate Personal Holiness More Than Personal Freedoms – This will be another controversial topic but one I see all the time. Pastors who spend more time telling you how many beers they had last week than what they learned last week in their quiet times with God do not last. God honors personal holiness. Pastors Whose Churches Have Sustained Health and Growth Have a Deep Passion for the Lost – They are more committed to life change and transformation than the transactional components of ministry. Pastors Whose Churches Have Sustained Health and Growth Show Pity to Others – The definition of pity is “the feeling of sorrow and compassion caused by the suffering and misfortunes of others.” There are times people need a pastor, not their small group leader. Compassionate pastors have hearts that break for the conditions of others. They weep with those weep. Pastors Whose Churches Have Sustained Health and Growth Have Proximity – A good shepherd smells like his sheep. They are always around their people and staffs. Good shepherds are accessible. Proximity keeps the staff working hard and accountable. So goes the leader, so goes the people. Pastors Whose Churches Have Sustained Health and Growth Are Dedicated to Personal Growth – Once again, growing churches are led by growing leaders. They are deeply committed to growing spiritually and in the areas of character, competence, chemistry and creativity. Pastors Whose Churches Have Sustained Health and Growth Love People – People are the only appreciable asset your church has. Everything else depreciates. Jesus thought so much of people He was willing to die for them. Also, here is an interesting thought: If the pastor has some spare time on Sunday morning, where does he or she gravitate? Is it solitude (green room) or people (lobby)? Pastors Whose Churches Have Sustained Health and Growth Have a Plan – They have a vision and a plan to see it become reality. Also, a failure to plan is a plan to fail. What are other practices have you seen in pastors who have sustainable ministries?